The Castello is one of the landmarks of the Florentine Chianti Classico territory, the area is particularly loved by wine enthusiasts because of a large number of wineries and typical restaurants offering of regional cuisine. It's the ideal base for day trips to the beautiful cities of Tuscany: Florence is only 25 km, Siena and San Gimignano about 45, about 55 Arezzo and Pisa about 105km away. The Castle is surrounded by the green hills of Chianti, surrounded by vineyards and woods where you can go for relaxing walks in the shade of the oak and chestnuttrees. The agriturismo has ten apartments for rent. The ancient stone farmhouse is surrounded by a refreshing garden with tables, chairs and parasols and a playground for children with swings, slides and picnictables. 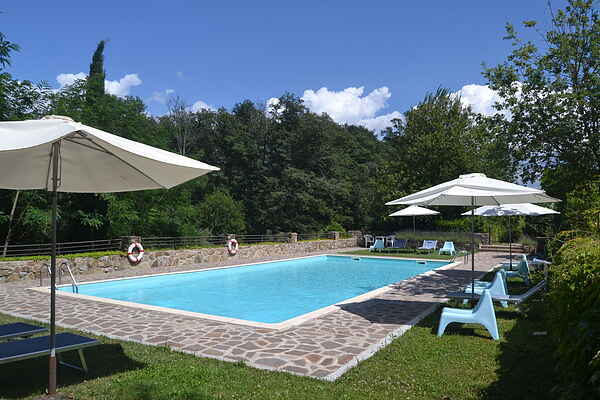 Next to the old farmhouse is a pool of 14 meters by 7, which is also equipped with chairs, sun beds and umbrellas for those who prefer to stay in at home in perfect relaxation. During your stay you can book a guided tour of the winecellars and taste and buy local products in a small wine bar.